Note:If you have this breed, or know anyone who does, please send a good profile photograph of the Dog (without humans in the background). We shall publish it on this page with credits. You can send it either by e-mail or post. A translation of the Peking Kennel clubs old standard for the Shih Tzu says it should have, " a lion head, bare torso, camel hoof, feather-duster tail, palm leaf ears, rice teeth, Pearly petal tongue and movement like a gold fish". 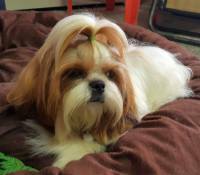 Although similar the the Lhasa Apso, this breed is different in origin. The hair on the nose grows upwards and it has a distinctive moustache. It has gained worldwide popularity. It weighs 5-7 kgs and is 25-27 cms tall. 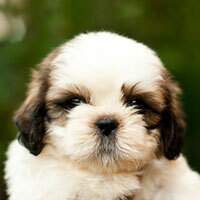 Vanilla Shih Tzu: Cute & Healthy Shih Tzu Puppies Available For Sale. Puppies are well socialized from birth. Father & mother are both extremely sweet and have lovely temperaments. 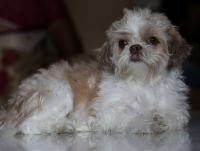 Puppies can be sent to any city in India. Click here to view litter box. For details contact: Mr. Siddhaant Trivedi; Cell: +91-91656-99954. Voyagerz Kennel announces its new litter of Shih Tzu Puppies with High Lineage, Champion Sire, raised with care and affection, with Rich Colour and Sound Health. Click here to see Litter Box, Photographs of Sire, Dam, Puppies and more details.